Posted: June 2, 2010 in Awards, QUACK! 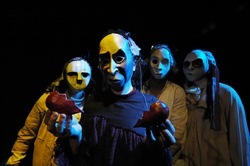 Devised by the cast under the direction of Rob Murray, featuring masks by Janni Younge and Emilie Starke, sound design by James Webb and Brydon Bolton, set design by Jesse Kramer, and costume design by Leila Anderson, QUACK! comes at you like a sensory cyclone, unfolding un a series of mesmerising images. But what is he hoping to achieve with the collected dreams and symbols? And what is he building in his private laboratory? And how long can people be deceived and strung along before turning against the liar? In a thrilling blend of physical and visual performance, infused with their signature approach to creating accessible, non-verbal performance, QUACK! is FTH:K upping the ante and boldly leaping into the unknown. Womb Tide: coming soon to a theatre near you!